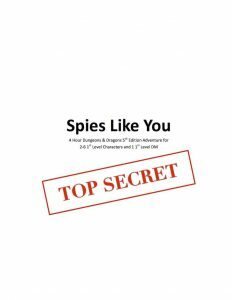 “Spies Like You” is published! I’m excited to announce that I have achieved #4 of my 2017 New Year’s Goals: I published a one-shot RPG adventure called “Spies Like You” earlier this month. Although it was self-published, six people (with only one self-proclaimed shill) have purchased it so far, so with a grand total of $1.94, I am officially a professional writer. Thank you WordArt for at least one graphic. Mission Impossible meets D&D. It’s your first mission as royal spies, and you will have to be crafty, sneaky, and clever to get through it. It is up to you to use your imagination to come up with the craziest ideas that might just work and improvise your way through dangers you definitely weren’t trained for.This 4 hour adventure is designed for both first-time players and first-time Dungeon Masters. It includes the adventure itself, background, basic tips on starting, several maps, monster stat blocks, and 6 1st-level pre-generated characters. Creating this one-shot adventure was very different from the D&D campaigns I have written and run in the past. Going into the project, I anticipated several factors that I was excited to try. First, I wanted to play more D&D, and I knew I would need to playtest many times. Second, since a player can’t honestly playtest it twice, I could introduce new players to the game. Third, a published adventure needed real maps, and I was excited to improve my drawing skills. However, I ended up discovering far more while I was writing it. When I finished the first draft of the adventure, I thought it was in good shape, and compared to my typical adventure, it was. For my regular games with the same players in the same storyline, I have somewhere between a week to a month to prepare for a 2-3 hour session. I spend up to 4 hours putting together maps, encounters, and rough notes about what will happen. Over the course of a month, I spent far more time writing the first version of a publishable adventure. First, I came up with the Cold War-like world from scratch and developed more backstory than I knew I would need. It took more time to build, but since it wasn’t a existing world, I could always change the world to fit the story without breaking canon. Next, I wrote the skeleton for the story. I wanted to start with a warmup to ease new players into the game, and I had other plot elements to weave in. For a regular adventure, I would put together enough bullet points to jog my memory during a game. For this one-shot, I wrote out far more detail because I knew it would become the basis for a formal document. In general for the first draft, I tried harder to make the story good. For my regular adventures, I have one play session to see how it goes. If the combat encounter was poorly balanced, my players will suffer through it, but at least it’s over quickly. I gloss over plot holes when they inevitably arise, and we end whenever we are near our time limit regardless of how far we got. If the story is flimsy, it is over with quickly. However, the one-shot needed to stand up to far more extensive playing. After completing the initial draft, I started playtesting first with myself as the DM, then providing friends with drafts to run themselves. I have detailed notes for each playtest from an observer (usually Julie), my own recollection, or a discussion with the DM. Unsurprisingly, they all turned out very differently. Although DMs sometimes complain about their players going offtrack, it makes each experience unique and interesting. With my regular game, we only see one outcome of the story: the planned bits and improvised elements all become canon. However, by playing the same one-shot adventure multiple times, I began to see the commonalities and, more importantly, the differences. Everyone wanted to burn down the building, but each group had a different strategy for getting information on a potential target. Between each playtest, I tweaked the story to make it better. I included fun ideas from individual games, removed unexplored plot elements, emphasized overlooked details, and tightened up slow sections. I really thought the first draft was good, but the final product was way better. The fundamental story is the same, but I changed many, small details, and it added up to a big change. So if you are interested in playing the adventure, either from prior D&D experience or from hearing way too much about it from me recently, let me know, and I would be happy to run it for you. Online tools and video chat have made it just as feasible to play remotely as to play in-person, so we can figure out a way to make it work. Thanks to all of the DMs who suffered through my drafts and playtested it, including Adam, James, and Julie. Thanks to all of the players who attempted to find coherence in the playtests, including Adam, Julie, Ben, Tom, Chris M, Ryan, Dave, Rebecca, James, Stephen, Emily, Jeff, Mark, Mary Jo, Joe, Alix, Kurt, and others. Next Next post: I Updated my Blog!